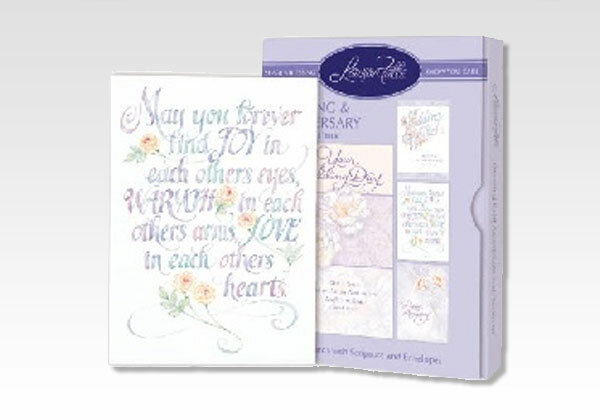 This assortment of 12 Lifetime Together themed Wedding & Anniversary cards from Lawson Falle features 3 each of 4 different designs with KJV Scripture. Each card is approximately 4 3/4"W x 6 1/2"H.
Front: May you forever find joy in each others eyes, warmth in each others arms, love in each others hearts. Inside: Sending wishes on this special day for a very Happy Anniversary. Inside: May your lifetime together be one of caring friendship, loving hearts and forever happiness. God's Blessings to You Both. Inside: May your love grow deeper and the years happier as you continue your journey together.